To say that Marla, a native to Southern California, has experienced ups and downs over the last few years would be an understatement. A single mother of five, Marla was living in Georgia before moving to San Diego to live with her sister. Having a support system was helpful for Marla and her kids, until her sister began using drugs. “I couldn’t have her around my children,” said Marla, and she was forced to kick her sister out of their home. While it was tough, it was important for Marla to have stability for her children, so she juggled multiple jobs to pay rent. However, in December 2016 her life was turned upside down. Right before Christmas, Marla was diagnosed with stage 3 breast cancer; this was the fourth time cancer had been detected in her body and her doctors recommended that she start chemo treatments immediately, forcing her to leave her jobs. No longer employed, Marla was struggling to pay her rent. Eventually, remaining in their home was no longer an option. It was then, that her landlord gave her Interfaith’s phone number and recommended that she meet with a case manager. 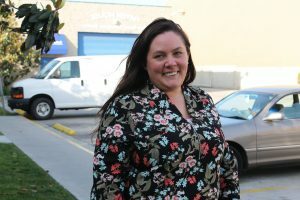 Marla worked the next few days with her housing case manager and was able to secure an apartment in Ramona, in the same complex as many of her children’s friends. Finding a new home wasn’t the only good news she received that month though: Marla was told her cancer was minimal enough that she could return to work while continuing treatments until she was in full remission. One week before moving out of their home and into their new apartment, Marla secured a full-time administrative position with a local trucking delivery company and was able to being saving again. Moving into their apartment was a relief, however the family had been forced to sell many of their belongings in the transition from their home. “When we first moved in, I was buying paper plates and styrofoam cups because all of our things were either gone or in storage – it was like we were basically camping,” said Marla. Thanks to the generous Interfaith donors who give to our Make-It-A-Home program, one week later Marla and her children received beds, a kitchen table, couches, plates, utensils and more. Marla and her family’s journey is just one example of how the Housing 1000 program changes lives. To learn about how you can get involved and contribute to the campaign today, please contact Robert Adams, Chief Development Officer, at radams@interfaithservices.org or by calling (760) 489-6380 ext. 206.